Rough Edges: Forgotten Books: Hearts of the West - Jean Marie Stine, ed. Forgotten Books: Hearts of the West - Jean Marie Stine, ed. As I’ve mentioned here before, I recall seeing new issues of RANCH ROMANCES on the magazine racks in various drugstores during the late Sixties and early Seventies. It was the last true pulp, although by then it was slightly smaller than regular pulp size and had trimmed page edges. I never bought any of those issues, though, because it had “romance” right there in the title, and I didn’t read romances. That’s what my mother read, for gosh sake! However, over the past fifteen years or so, I’ve read numerous issues of RANCH ROMANCES and have developed a real appreciation of the Western romance. Far from being sappy, many of them have their fair share of gritty action. Romance is a pretty primal emotion, after all, and a talented storyteller can spin a good yarn from it. 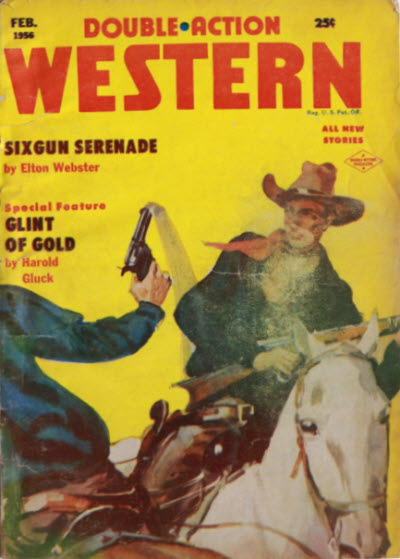 HEARTS OF THE WEST is a collection of Western romances gathered from a variety of pulps and a few slick magazines. None of them are from RANCH ROMANCES, and indeed, only one story is from a pulp recognized as a Western romance title, THRILLING RANCH STORIES. But that doesn’t make them any less well-written and entertaining. The book opens with “Guardian Angel” by Gene Austin, originally published in THRILLING WESTERN, November 1952 as “The Beautiful Guardian”. 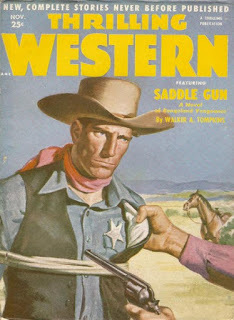 When I started reading this one, I immediately realized it was familiar, and when I looked it up, I discovered that it appeared in an issue of THRILLING WESTERN I had read and blogged about fairly recently, so I’ll just repeat what I said about it there: “The Beautiful Guardian” by Gene Austin, an author who wrote several dozen stories for assorted Western pulps, none of which I recall reading until this one. It’s a pleasant enough yarn about a young cowboy, a trio of trouble-making brothers he’s feuding with, and two beautiful young women, one of whom he wants to marry and the other who wants to marry him. This seems like it should have appeared in RANCH ROMANCES in an earlier era, but it’s probably not hardboiled enough for the Fifties version of that magazine. “Frontier Spirit” by Ann P. Hurt appeared in DOUBLE-ACTION WESTERN, February 1956, as “The Resourceful Week of Little Silly” by A.P. Hurt. It’s a wagon train story about the pampered daughter of a rich man who has to take care of herself and deal with the dangers of the frontier. The plot’s fairly predictable, but I thought it was handled well and I enjoyed the story. John and Ward Hawkins were brothers from Canada who started writing for the pulps in the Thirties, mostly detective and adventure stories, but by the Forties they were writing serials for THE SATURDAY EVENING POST and COLLIER’S and eventually wound up in Hollywood where they wrote a lot of TV episodes for such series as VOYAGE TO THE BOTTOM OF THE SEA, BONANZA, and LITTLE HOUSE ON THE PRAIRIE. Their story “Pioneer Woman”, published in the August 31, 1940 issue of LIBERTY as “Pioneer Lady”, is another wagon train tale, although it’s set for the most part in St. Joseph, Missouri, as a wagon train is forming to head for Oregon. The protagonist is a young woman with two children whose abusive gambler husband has abandoned her, but he shows up to make her life miserable just as she’s trying to make a new start by joining the wagon train. Some nice twists, as well as a murder, give this story a fairly hard edge, and it works quite well. 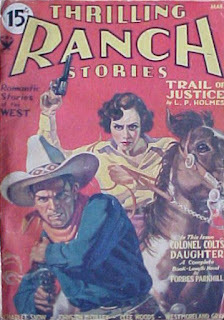 Charles H. Snow, the author of “Blue Eyes and Blue Steel”, from the March 1934 issue of THRILLING RANCH STORIES, is best remembered for one thing these days: a novella called “One ‘Hopped-up’ Cowboy” which appeared in the July 1936 issue of WILD WEST STORIES AND COMPLETE NOVEL MAGAZINE. I’ve never read it, but I seem to recall reading that the hero of that one is known as The Marijuana Kid. Snow is an interesting author over and above that one story, though. A former miner, he was blinded in an accident in 1914 and decided to become a writer in an attempt to support his family. He dictated his stories to his daughter, who then typed and submitted them. He sold a good number of stories to the pulps in the Twenties and Thirties but found his best market in England, where he sold more than 400 novels under several different pseudonyms. He was also elected to the position of justice of the peace in Napa, California, during the Twenties and served as a mentor to Western writer L.P. Holmes, who always referred to him as Judge Snow. I had never read any of his work before “Blue Eyes and Blue Steel”, but I really enjoyed this tale about a rancher’s daughter pursuing a dangerous outlaw. I saw the big twist coming but thought the story was well-written enough to be very entertaining, anyway. Snow skimps a little on the action at the end, but I was still impressed enough that I want to read more by him. Zachary Strong was a house-name, so there’s really no telling who wrote “Cup of Happiness”, which appeared in the April 1940 issue of COMPLETE NORTHWEST. It’s a Northern, as you’d expect from the magazine where it was published, and takes place in Canada. A schoolteacher who loses her job when the boomtown where she’s been teaching is abandoned for a new strike elsewhere decides to become a prospector herself. Things don’t go well. The resolution of this one seems really far-fetched to me, but I’m not a miner, so what do I know? “The Marquis and Miss Sally”, EVERYBODY’S MAGAZINE, June 1903, under the name Oliver Henry, is set in a roundup camp on the Texas range and features the trademark twist ending of an O. Henry story. I didn’t see the twist coming until very late in the game. This is an excellent story. I put O. Henry in a book once as a supporting character, before he was a writer and was just a bank clerk named William Sydney Porter. “End of the Trail” by editor Jean Marie Stine is the only tale original to this collection. It’s a “stranger rides into town and takes on the local bully” story with a couple of nice twists. Well-written and shows that Stine knows Westerns. 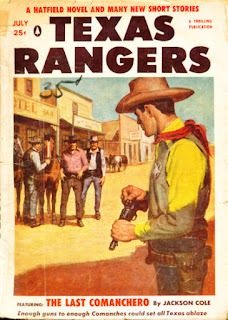 Frank Bennett, writing under the pseudonym Ben Frank, had stories in many issues of TEXAS RANGERS during the Fifties, most of them featuring his series character Doc Swap, and to be honest, I’m not a fan of them. 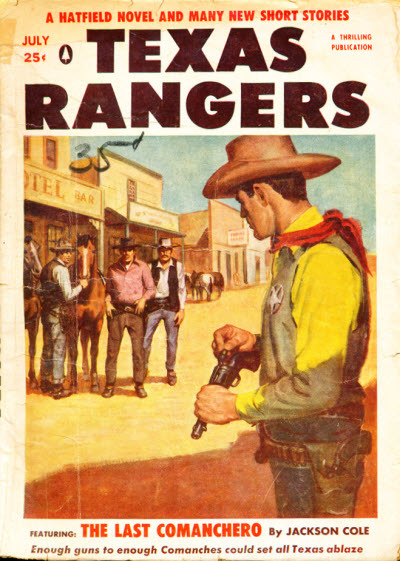 His stand-alone story “The Bar-Girl, the Battle, and the Bar-D” (TEXAS RANGERS, July 1957, as “A Woman for the Bar-D”) is pretty good, though. A widowed rancher looking for someone to care for his young daughter hires a woman who’s new in town and winds up with more trouble than he bargained for. This one is a lot grittier than the author’s Doc Swap stories, which probably explains why I liked it quite a bit. “Big Nose Kate’s Man”, by Marie Antoinette Parks, originally published in REAL WESTERN STORIES, June 1956, as “They Ain’t Going to Lynch My Man” by Will Watson, is a short, mostly historical piece about Doc Holliday and his lover Big Nose Kate set in Fort Griffin, Texas, when Doc is arrested for murder. It’s okay but there’s not much to it, making it the weakest story in the collection. 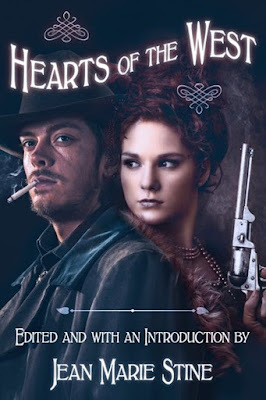 Overall, I found HEARTS OF THE WEST very entertaining, with several excellent stories (the ones by the Hawkins brothers, Charles H. Snow, and O. Henry were my favorites) and all of them quite readable. 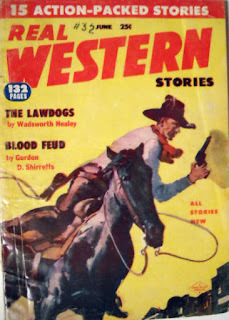 I’d love to see more such collections of Western romance stories from the pulps and think this one is well worth reading. I've been reading collections of O. Henry stories (THE COLLECTED WORKS OF O. HENRY was very cheap on the Kindle) and was surprised how many Westerns he wrote. And he created the Cisco Kid, sort of. I really ought to read more of his stories. I'll check out that collection.